If you have ever gone into a chicken coop at night you will see that chickens are very sound sleepers. You can walk around and even pick your birds up much easier than you can during the day. For that reason, they like to be off the ground while they are snoozing to keep away from any predators. 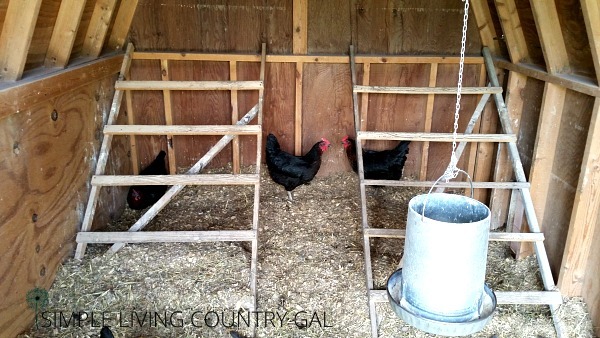 To help provide a safe sleeping area for your girls you can and should add a chicken roost to your hen house. What is a chicken roost? A chicken roost is a place for chickens to perch on that is off of the ground. A ledge, a ladder or even sticks will do the trick. Chickens like to be up off of the ground at night and it helps them to feel safe from predators. I realized just out how important this is one night when we could not find one of our hens. We spent quite a bit of time searching for her. 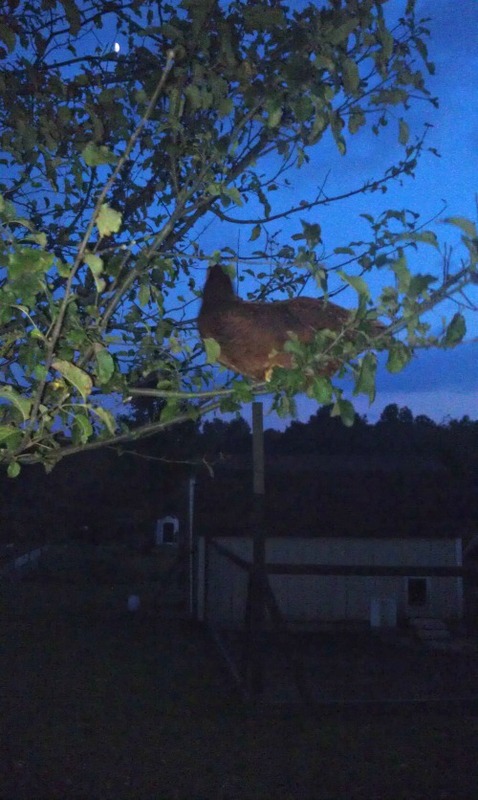 After a bit, we and finally found our escaped beloved hen perched in our apple tree. Don’t worry, we rescued her and returned her to the coop with her gal pals. Ninja tip: If you free range your birds teach them to come when called. By calling your chickens every time you feed they will learn to associate food with that call. Now you can. call your girls in at night ensuring everyone is present and accounted for. However, you may want to go one step further and do a head count when you close them up for the night. For years we used a ladder roost with smaller boards to roost on, but I knew I needed to fix what we had. Those ladders although nice took up quite a bit of room in our coop and the rungs were not the correct size for the birds. We needed to find a way for the hens to roost that would not take up so much space in our coop. 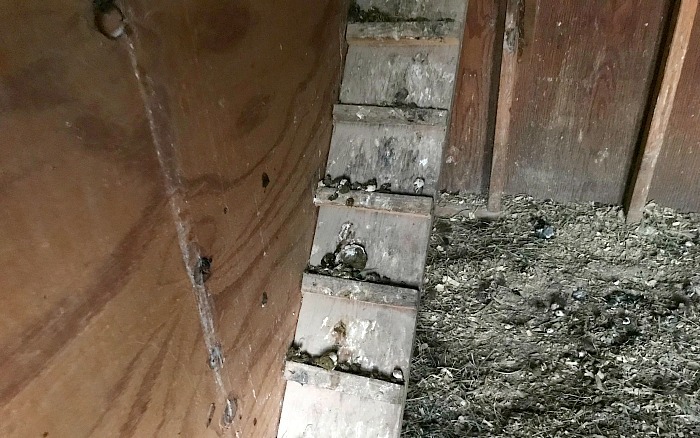 It was also difficult to clean under the roosts which is important if you want a cleaner coop. By placing a board under a ladder roost that you can remove and clean daily you will eliminate the smell and mess. 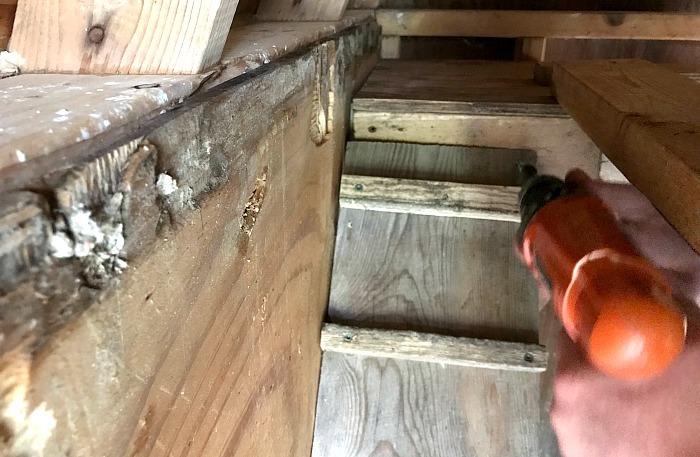 However, when using a ladder roost it requires a bit of tricky maneuvering to get the board out without spilling it’s contents. What size is best for the rungs? 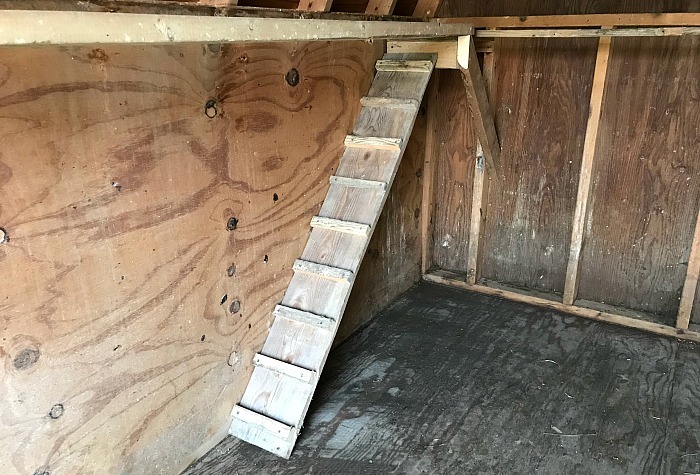 Chicken roost bars should be at least 2″ wide, but 4″ is better. Chickens are not like most birds. They do not like to grip their roosts. They prefer to sleep flat-footed rather than wrapping their feet around the bar. If you have a small number of birds, a ladder will work just fine, however, make sure it is secure and there is no risk of toppling over. 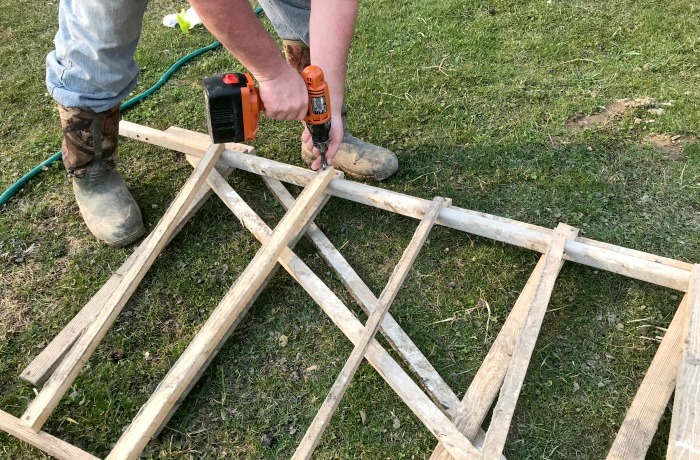 For our latest roost, Handy Man Hubby used a newly purchased 2×4 for one side and a scrap wood from the frame of our old chicken roost for the other. How high can your roost be? 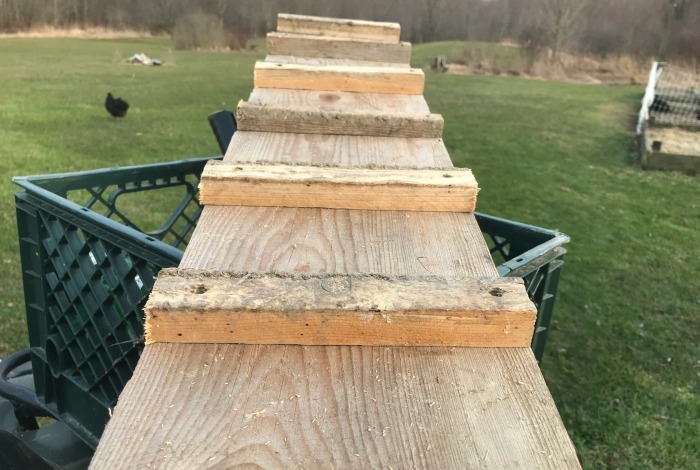 You can make your roosts any height, but if you choose to build a tall roost it is important to have steps like a ladder. Try to leave enough headroom for your hens, 15″ should be good but this will vary depending on your breed. Eventually, your hens will fly up to the roost and jump back down but there will still be a few hens that prefer the ladder. For our ladder, we used scrap pieces of wood from the old roost to create “rungs” for the girls to walkup easier. Each rung was screwd on to the main board and trimmed off so there was nothing hanging over. Once finished, we had a ladder that the girls can use to gain access to the new chicken roost. Ninja tip: To get my girls to use the ladder I sprinkled scratch onto the steps. This taught a few to walk up pecking at treats along the way. Eventually, as with most flocks, the other hens followed the leaders and know use the ladder without my having to leave treats on the steps. Finally, the ladder needed to have a landing. The reason Hubs did this was to make it easier for the hens to move around once at the top. Since we have quite a few chickens in our coop it was important to ensure we had plenty of room for everyone. To do this we needed the roost to span two sides of our coop. 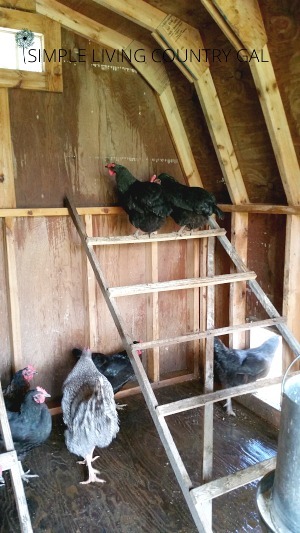 With the little landing, the hens can now climb to the top and choose which way to head off and roost. How much spacing do you need? You should try for at least 8″ per hen. In the winter you will be amazed at how they like to snuggle up. In the summer my gals will spread out and use most of the space available. If you are housing a lot of chickens in your coop you will need a roost that allows for plenty of space for each hen. If you find some of your hens sleeping on the ground and not on the chicken roost you will want to find out why. It is either because there is not enough room on the roost or your chickens do not like the set up you have. 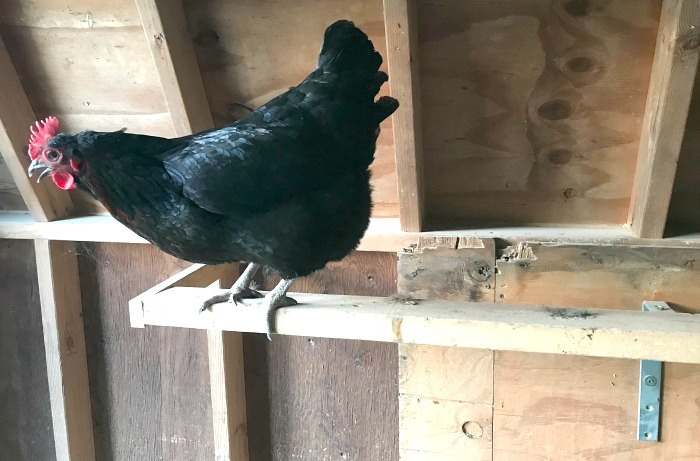 In that case, you will either need to add a second roost to allow for enough room or another type of roost for the chickens to use. For our newest chicken roost, we found 1 hen that refused to use it. Rather than try to force her I simply placed an old step ladder inside. She now prefers to roost on the ladder and is no longer on the ground where she is not safe. 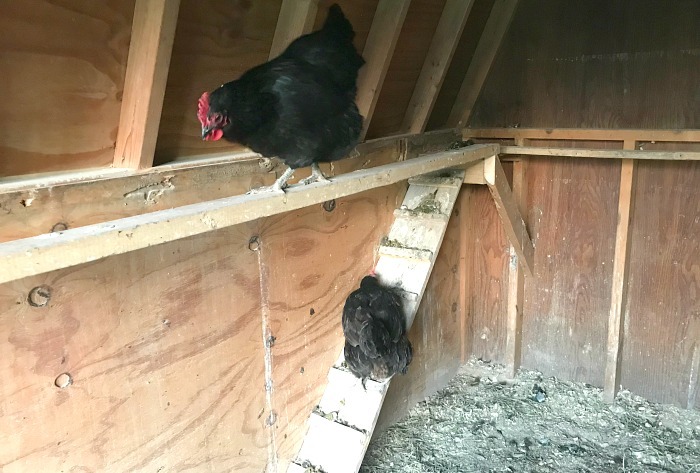 As you can see by the little “deposits” on the steps, she likes to be on the very top portion of the ladder which ironically enough is very close to the height of the new roost. I am hoping that eventually she will just make the leap up to be with her pals. Ninja Tip: If this was a younger hen I would have worked with her to get her used to the new roost. 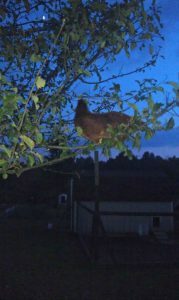 How to do that is to put her on the roost after DARK (not dusk) when it is easy to pick up and move chickens. After a few evenings of this, she would have learned the workings of the roost and felt comfortable enough to use it on her own. However, since we plan to sell her in a couple of months there was no reason to do the training and the ladder solved the issue without stressing her out. It is important to know your animals and work with them rather than force them to do anything. Once you begin forcing you will lose the trust of your animals. If you want to train any animal trust is always the first step. Gain their trust no matter what type of animal they are. This trust will make it easier for you to touch them and pick them up which is necessary for first aid and other hands-on work. As you probably already know there is a pecking order for chickens and nowhere is this more evident than on a roost. The more dominant hens will be on the highest rungs with the lesser birds down lower. Just make sure you have plenty of room to deter henpecking. This is another reason why I like one level over the ladder. I did have one rooster and he always slept on the bottom rung alone. I think he felt better able to protect the hens from that vantage point. 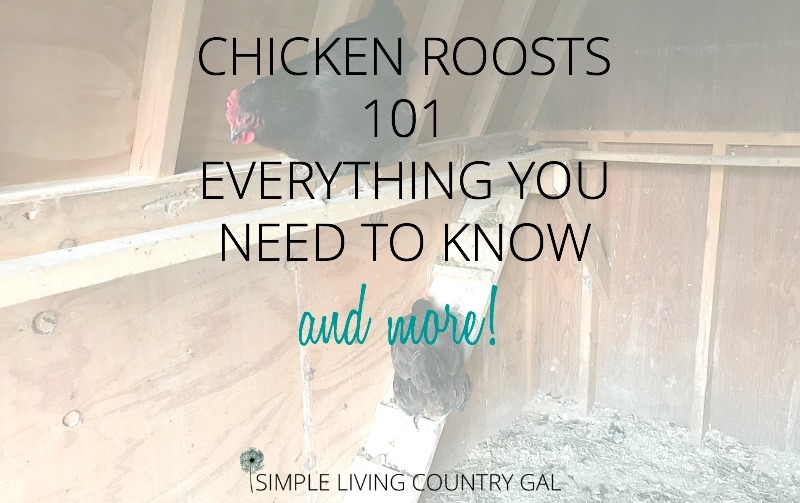 Where should you place your chicken roost? You may not realize it, but hens poo when they sleep. A LOT. I was shocked at how much. I still am actually! So keep this little tidbit in mind when you choose your location. I like to keep a “scrape board” below my roost. A scrape board is simply a small piece of scrap wood that you place under the roost. This board gets cleaned every day and that helps keep the coop free of mites and other bugs. 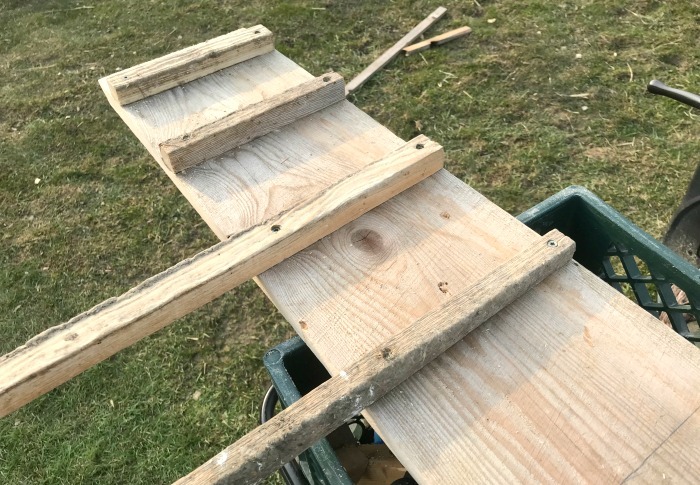 If you choose to use a scrape board as well, you will want to place your roost so that it is easier for you to get the board in and out. With our newest roost, I found my hens preferred to sleep facing into the center of the coop. This surprised me a bit. 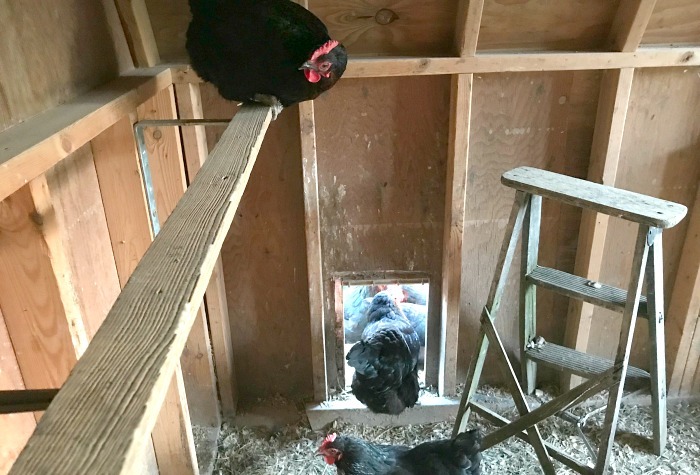 On the ladder, they preferred to roost facing the back wall. So when I saw our new ladder invention covered in poo that first morning I was pretty upset to see it. After a bit, I realized this was actually a “good thing”. That ladder now doubles as a scraping board and gathers up the mess quite nicely from the night before. 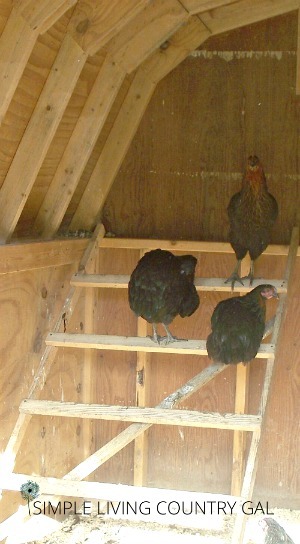 Although my hens do use the ladder to get up to the high roost they do not use it to get down. So, there is no worry about them stepping in piles of poo. To clean the ladder I cut a “V” in a bucket. This lodges nicely onto the ladder and a small scraper will remove the debris into the bucket without it falling to the floor below. No, I do not get it all but I do get most and that is good enough to keep the coop relatively clean. With so many families trying out there hand at homesteading raising chickens is a wonderful way to get started. If you are new to chickens you will need just a bit more information besides setting up a roost. Yes, there is a lot that goes into raising chickens but once you have an idea of what they need and how to keep them safe and healthy you are good to go. Read the above articles for a pretty good overview and you won’t be caught off guard. 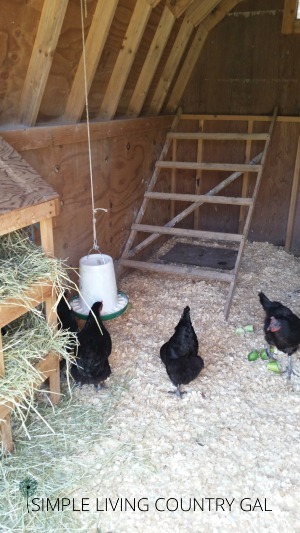 Chickens are a fun way to add livestock to your home and a great learning tool for children. Do your homework and ask questions so you are ready for a long and happy relationship with your hens. Not to mention a steady supply of yummy fresh eggs! You know what? You are absolutely right! I went back in a added the missing info along with some other useful information. I am so glad you pointed it out to me.